If you live in Florida and want to landscape your yard but don’t know where to start, you have come to the right place. 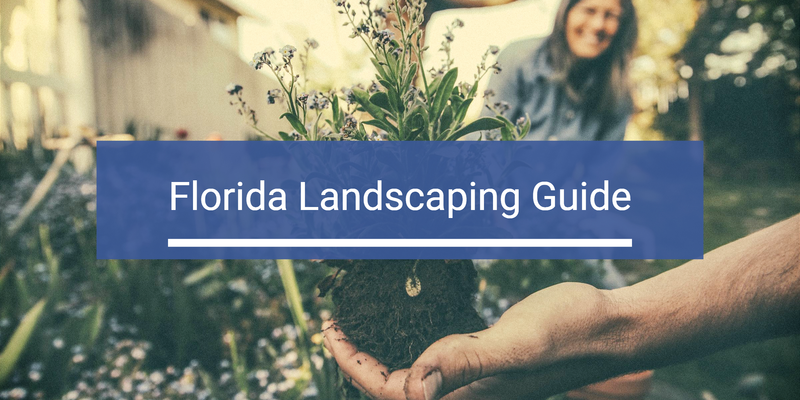 Our Florida landscaping guide gives you a general overview of landscaping basics so you can follow the right steps and get the most from your yard. As you move forward, you will learn the main benefits you can enjoy once you implement a landscaping plan. So many unique and interesting plants thrive in Florida. You might find yourself overwhelmed by the choices. And, since Florida covers many plant hardiness zones, you need to make sure the plants you choose will survive your local conditions. We’ll show you everything you need to know to start your landscaping journey in the right direction. This guide will give you the required knowledge to act with peace of mind and confidence. The results you want are closer than you think and, after taking the critical first steps, you’ll love your yard all over again. Many Florida homes go for the tropical landscape look. But there are many different styles that you can go with to match your home, your neighborhood, and your personal style. Spend some time driving around looking at yards you admire. Maybe sneak a photo or two to keep as a reminder. Enhancing the look and feel of your property is the #1 benefit of following a solid landscaping plan, but that’s only the beginning. If your goal is to sell your home for top-dollar, landscaping your yard increases the value of your home and attracts even more potential buyers. If the new landscaping is for your personal enjoyment, your yard can become a relaxing space that reduces stress and revitalizes your mind. A well-planned landscape can give you and your family a fun and productive activity to share, and everyone in the family can enjoy learning about and caring for your plants. Plus, grass and plants keep your surroundings much cooler than concrete or asphalt. Trees provide shade that allows you to enjoy outdoors in the summer and helps reduce your AC bill. Planting the right plants in the perfect spots is an essential part of landscaping you can’t afford to overlook. Begin by getting to know your yard and the type of soil you have around your property. Pay attention to the spots around your home that get the most sunlight, and the most shade and choose your plants accordingly. Even if a plant says ‘full sun,’ it will survive in partial shade in Florida. Since we’re talking about Florida, you need turfgrass that is resistant to drought, which also helps save money on irrigation. When buying plants to add to your collection, group plants with similar needs in the same area. Consider any obstacles that might be present, and plan your landscaping project in a way that makes it easy to maintain. Make sure each plant on your property gets enough water if you don’t want your yard to wilt and die. Most people know that all plants need plenty of water to stay healthy, but you might not know that giving plants too much water is also harmful. Learn about each plant’s water needs so that you can offer the proper care. Using a rain detector is a smart way for you to know how much water your plants have gotten from nature each day, but you can even integrate the sensor with an automated sprinkler system. The sprinklers will turn on and water your plants and grass if you have not been getting enough rain. We always recommend rain detectors when installing new irrigation systems for our customers. Mulch is a valuable resource for anyone who plans to landscape a yard, and it offers many benefits you maybe hadn’t considered. Having a 2-inch layer of mulch around your plants helps the soil retain moisture, giving your plants plenty of time to drink. The seeds of invasive weeds can blow onto your property and invade your yard with little warning, causing your plants to wilt away. Mulch stops those seeds from contacting the ground, and you won’t need to worry about them as a result. If you are looking for a viable way to keep unwanted weeds at bay, never overestimate the power of mulch. A layer of quality mulch will take you far if you want to keep your soil at the right temperature for your plants to thrive. Did you know that having wildlife in your yard can improve your landscaping efforts? While bees can fertilize your plants and help them grow, birds can eat invasive insects, keeping your plants in great shape for as long as possible. Wildlife also enhances the environment and makes your yard much more attractive. Flowers can entice honeybees to enter your property, and you can place a birdbath and feeder on your land to let birds know they are welcome to visit. Depending on the size of your yard, consider placing several birdbaths throughout your property. Just make sure they don’t turn into mosquito breeding grounds. Allowing the right types of wildlife onto your property can enhance your results in no time. Although some wildlife can benefit the look and health of your yard, harmful pests can cause a lot of damage if you don’t find a way to stop them. If you’re not proactive, they can eat your plants and destroy them before you spot the warning signs. Keeping an eye on your yard is one of the top ways to safeguard it from harm. Remove dead leaves and the wilted parts of your plants to contain the issue in the early stages. To take care of a more persistent pest problem, buy an eco-friendly pesticide that won’t hurt your plants. Rather than treating your entire yard, focus on the spots that show the most signs of pest activity. Florida is paradise. Warm weather, beaches, mild winters (if a winter at all). Top it off with a beautiful lawn, a relaxing yard and increased home value, all through careful planning of your landscaping. Knowing what to do at each step and keeping some proven tips at the top of your mind can do wonders for your results. You will be thrilled when you see the way your lawn looks once you finish the job, and the outcome will put a smile on your face. Giving your property a look of which you can be proud is not as difficult as you once thought.